Pak Tai Temple - The oldest temple on the island this was originally built in 1789 though it was greatly renovated 200 years later and the present building is of modern construction though maintaining all the original design, decoration and content of the original. 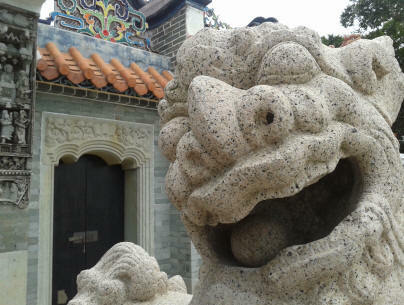 Traditional stone lions, one with a ball in its mouth pictured here, guard the temple entrance in classical Chinese style. The layout of the temple is very classical with a central hall for worship accommodating the two statues of the main deity worshiped and then two smaller halls on each side. Inside the temple are to be found the typical alter for worship but also cases holding some of the relics important to the village. A wooden sedan chair made in 1894, a large stone bowl or caldron carved and dated from 1861 and two carved stone pillars with decorative lions from the turn of the 20th century. Rock Carvings - Neolithic designs are carved on a rock below the Warwick Hotel, although nobody knows the meaning of them it is presumed they must have been of high importance. Today this archeological site is covered by a protective glass enclosure but can still easily be viewed. View from North End - It is a long walk but a rewarding one on a clear day to reach the far northern end of the Island, having travelled along the Cheung Chau Family Walk as far north as it will go, right up against the aircraft navigation radio marker, and then striking out along dirt paths northward you can arrive at the highest point of the north of the island with outstanding views not only back towards the body of Cheung Chau itself but also all around. Very few places in Hong Kong provide some 360 degree panoramic experiences, and this one on Cheung Chau is surely one of the easiest to reach. No climbing gear is needed but a good set of hiking boots will make this trip a more pleasant experience. Windsurfing Monument - Cheung Chau residents are particularly proud of her most famous Daughter, the Olympic Gold Medalist Lee Lai Shan who won in the 1996 Atlanta Olympics. "San San" as she is known locally was born on Cheung Chau and learnt her sport there. First coached by her Uncle Lai Gun who still reaches windsurfing on the island she then went on to greatness. There are two monuments to her success, one unofficial is located at Cheung Chau Windsurfing Centre, still operated by her uncles' family, on the small rocky outcrop between the two main beaches of Cheung Chau. Another Official monument was erected overlooking the main beach in a small public sitting out area. Cheung Po Tsai Cave - Reputedly the hiding place of a famous pirate, this small rocky alcove can be found by following signs from Sai Wan and the south western end of the island. Either walk along the open promenade all the way to the end, or take a Sam Pan ferry for the two minute trip from the main Public Pier to the Sai Wan pier. Then it is 10 minutes uphill walk to the cave. Remember to take a torch! After your trip to Cheung Chau don't miss out on some of the other great attractions around Hong Kong.